Elementary students from across Vancouver Island came to Port Alberni’s Echo Centre on Friday, May 4 to recognize their local heritage. Last fall Joshua Ogden decided to start a soccer program for youth in his remote northern British Columbia village of Kyuquot. 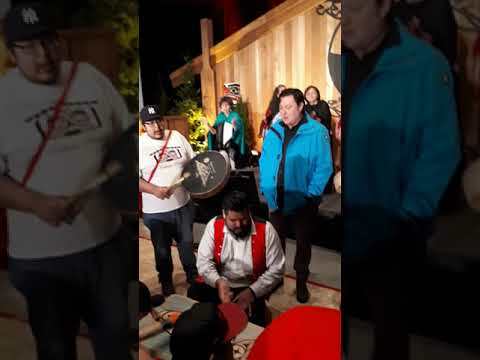 Hupacasath First Nation hosted an opiod crisis workshop at their House of Gathering on May 2, with the goal of setting up a proactive response to the growing menace. A Tla-o-qui-aht fisherman who has seen generations of change on the water is responding to a recent court judgement with cautionary words. Whether we’re working, relaxing at home or sleeping, a reality of modern life is the continual dependence on electricity. A pair of Nuu-chah-nulth teenage hockey players will be heading to Nova Scotia this May to vie for national championships. Over a dozen women’s and men’s ball hockey teams from across Vancouver Island took to the hardwood in Maht Mahs this weekend for the Annual Cancer Awareness Hockey Tournament. Tseshaht members took part in an intensive five-day first responder course in the Tseshaht Hall from April 23 through 27. Grace Frank encounters the effects of British Columbia’s opiod crisis every day as she tries to help family members in the grip of drug addiction, including her 33-year-old son. Drivers on their way to Tofino and Ucluelet can expect intermittent road closures in the 1.6-kilometre Kennedy Hill zone beginning on May 7. The central region Nuu-chah-nulth tribes can expect to see a variety of cultural and environmental benefits from the Clayoquot Biosphere Trust’s new Vital Grant program. Two classes of Tseshaht First Nation students learned how to operate high-tech forestry equipment on simulators provided by Vancouver Island University on April 20. The people of Kyuquot are asking why the BC Ambulance Service refused to perform an air evacuation on Sunday evening, after a young resident fell critically ill with appendicitis. Negotiators for five Nuu-chah-nulth nations are claiming a legal victory after the B.C. Supreme Court announced details from a round of litigation on their fishing rights.